Asparagus Enhances the Flavor in Our Creamy Combination of Mascarpone, Ricotta & Parmesan Cheese, added to that are Butter, Shallots, Dry Sherry, Lemon Zest, & Nutmeg to Create an Irresistible Taste. This Colorful Character is Packed with Spinach, Dry Ricotta, Onion, Parmesan Cheese, Garlic, Basil, Parsley & Spices, Surrounded in Our Basil Pasta. A Traditional Italian Favorite with a Flavorful Twist. Spinach, Basil, Ricotta Cheese, Imported Parmesan Cheese Blended to Create a New Dynamic Dimension to this Classic Florentine Flavor. Our Savory Black Pepper Pasta is Filled with Portabella Mushrooms, Onion, White Wine, Cream Cheese, Heavy Cream & Spices. Great Flavor Combination. A Blend of Roasted Vegetables, Onion, Mushrooms, Corn, Carrots, Zucchini, Red and Yellow Bell Peppers, and Spinach are Combined with Parmesan Cheese, Mozzarella and Seasoned with Garlic, Basil, then Wrapped in a Jumbo Square of Our Home-Style Egg Pasta. So Delicious, it's Quickly Becoming One of Our Best Sellers. 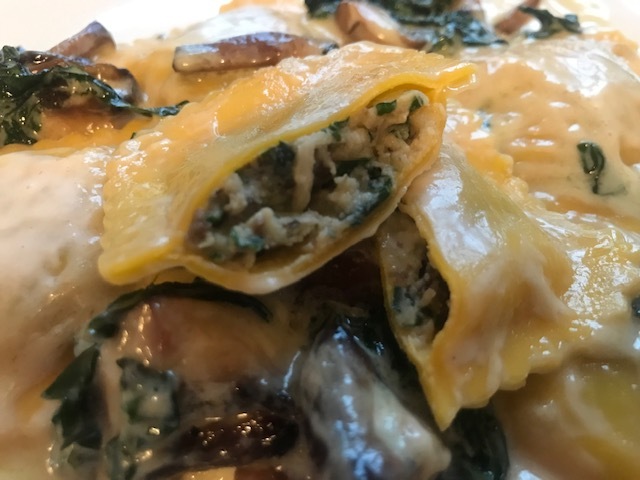 A delicious blend of Crimini Mushrooms, Ricotta Cheese, Pecorino Romano Cheese, Kale, Roasted Garlic, White Wine, Heavy Cream, Salt & Pepper wrapped in our Jumbo Square Egg Ravioli. Taste the Robust, Earthy flavor of Porcini, Crimini, Shitake Mushrooms with leeks, Mascarpone Cream, Butter, Marsala Wine, Veal Stock, Thyme stuffed into Our Newest 3" Retangoli Shaped Egg Pasta. Chunkier Filling! First We Roast Butternut Squash to Enhance the Flavor, then we Combine it with Red Bell Pepper, Onion, Parmesan, Butter, Maple Sugar, Sage, Salt & Pepper. One of Our Best Selling Signature Ravioli!